6 Bdrm Detached Dwellhouse. Ground flr: Hall. Cloakrm with wc. Lounge. Dining rm. Dining kitch. Conservatory. 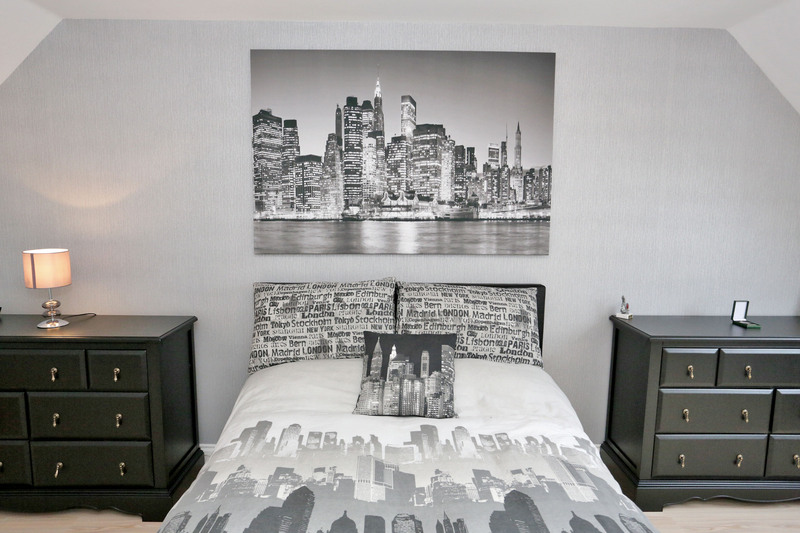 1st flr: 4 Bdrms, 1 with ensuite and 2 with access to Jack & Jill shower rm. Study. Bathrm. 2nd flr: 2 Bdrms. Shower rm (CT band - G). Garden. Garage. Parking. 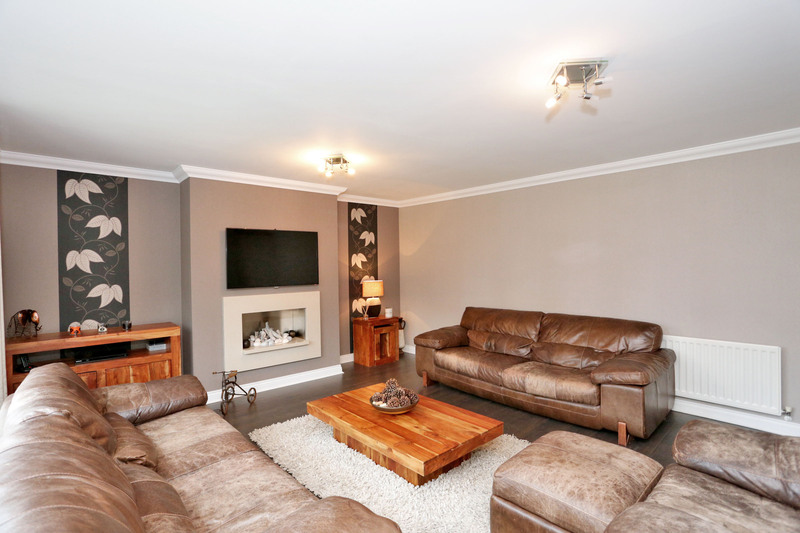 Fixed price £420,000 Entry by arr. Viewing contact solicitors. (EPC band - C). 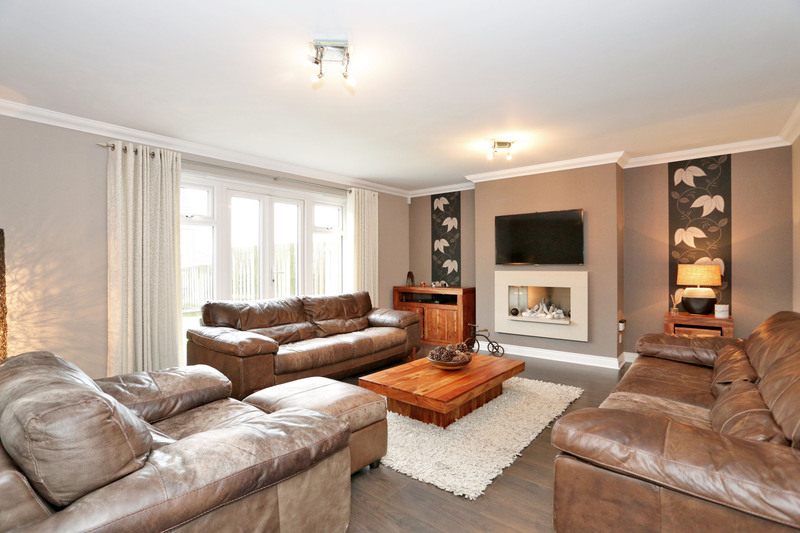 We are delighted to offer for sale this most attractively and stylishly presented "Braemar" 6 bedroom family home situated in the extremely popular and sought after residential development of Osprey Village completed by Barratt Homes. 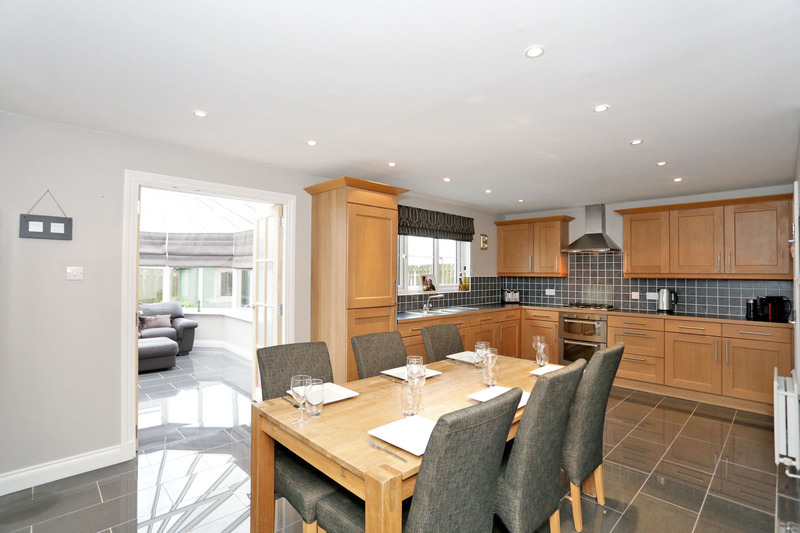 Enjoying superb open views of the rolling countryside, the River Ury towards Inverurie and Bennachie in the distance, this property benefits from luxurious cream carpeting, Amtico and Pergo flooring and underfloor heating in the family bathroom and master en-suite. 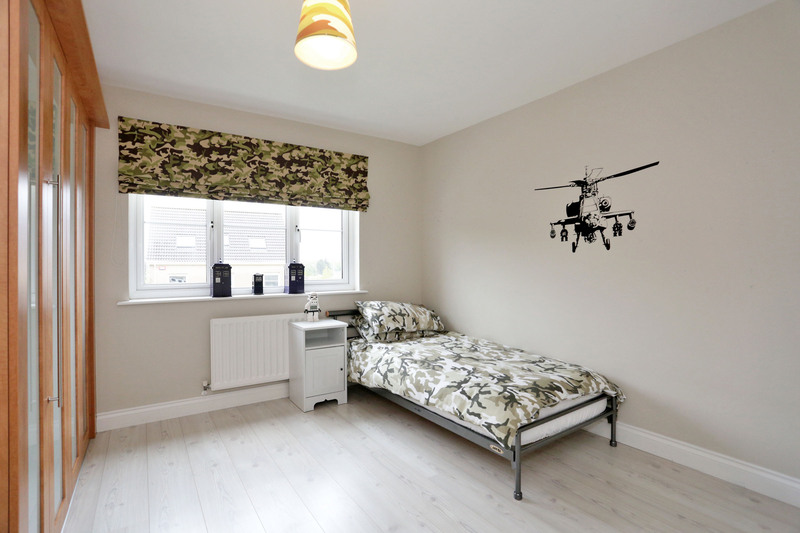 The bright and sunny accommodation includes the entrance hallway, lounge with French doors providing access to the rear garden, separate dining room, large dining kitchen, conservatory and a games room. Outside a double drive leads to the extensive double garage. 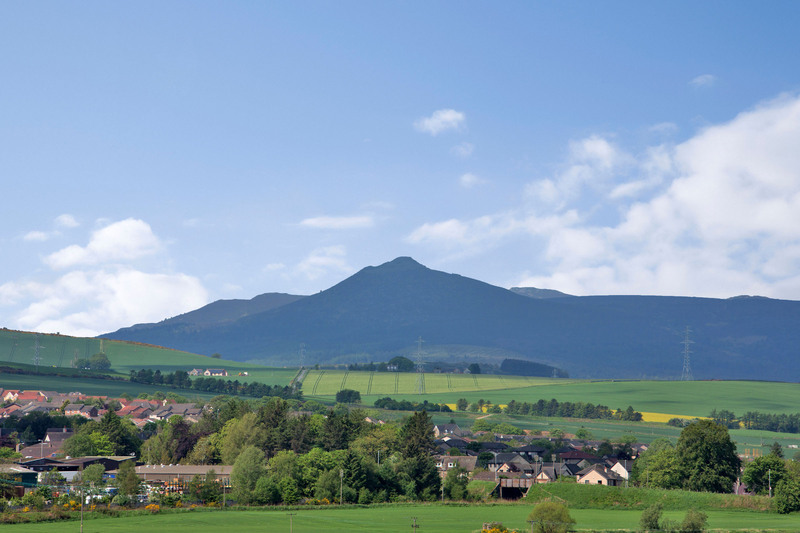 Inverurie is an expanding and prosperous town with excellent road and rail links to the north and south including Aberdeen, Dyce, Huntly and Elgin. There are several primary schools and Inverurie Academy provides secondary education. 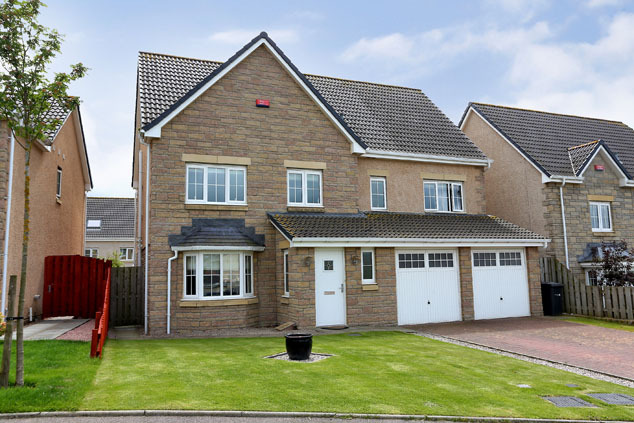 There is an excellent health centre, hospital, several large supermarkets, a swimming pool and community centre nearby as well as gold, tennis, bowling and hillwalking. ENTRANCE HALLWAY The main white wooden door with a decorative glazed panel provides access into the entrance hallway. Natural light flowing from the lattice effect window fitted with a Roman blind illuminates the neutrally decorated welcoming hallway. 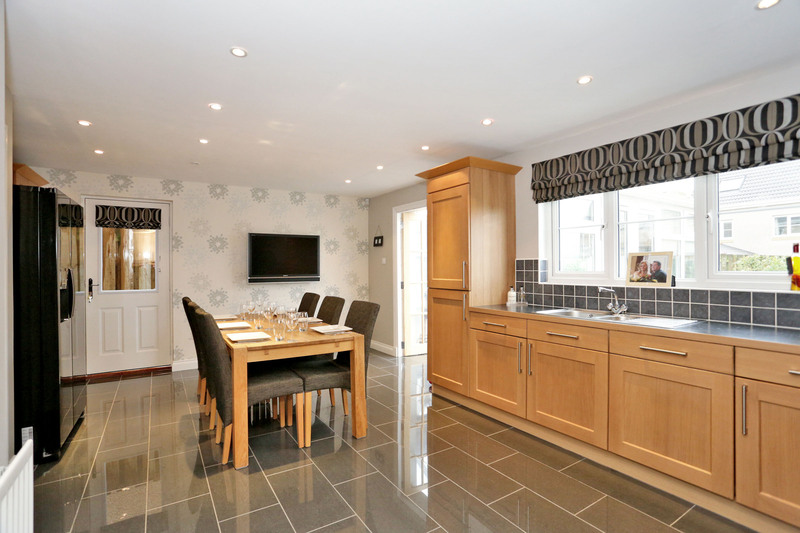 High gloss ceramic tiled flooring provides a modern and welcoming first impression into this executive family home. Alarm panel. Heating thermostat. Downlighters. Smoke detector. Radiator. CLOAKROOM/ TOILET Located to the front of the property the cloakroom is fitted with a modern two piece white suite with tiling behind and a vanity, storage unit below. 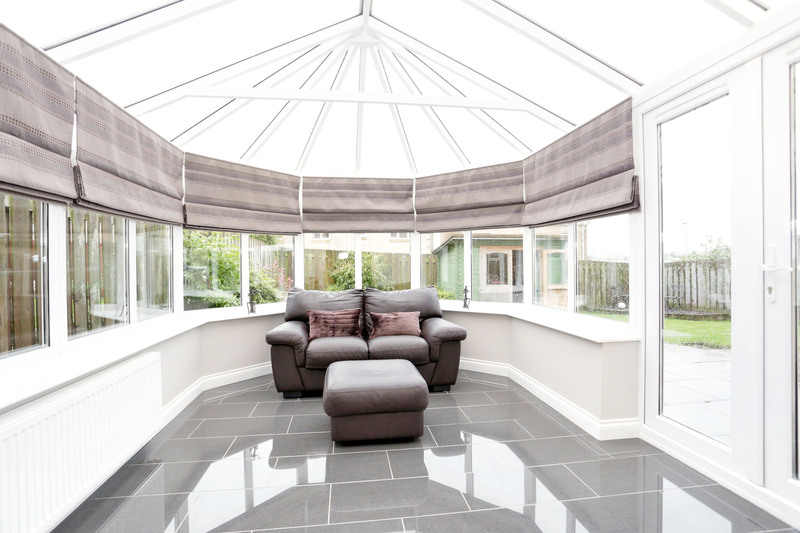 With an opaque lattice window fitted with roman blind to, the cloakroom has high gloss ceramic tiled flooring, central light fitting, radiator and chrome towel rail. LOUNGE 4.45m x 5.35m Accessed from the hallway this generously proportioned and attractively presented lounge is in excellent decorative order and benefits from an abundance of light streaming through the French doors providing access to the rear garden fitted with neutral curtains. The contemporary feature fireplace houses a 'Living Flame' gas fire encased by stone effect surrounds and provides an attractive focal point. 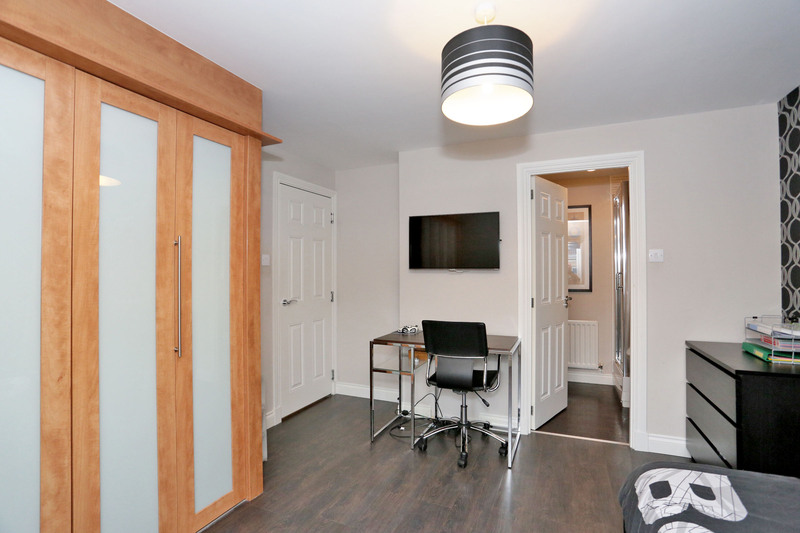 Ceiling coving, Pergo flooring, two modern light fittings, two radiators, television and telephone point. 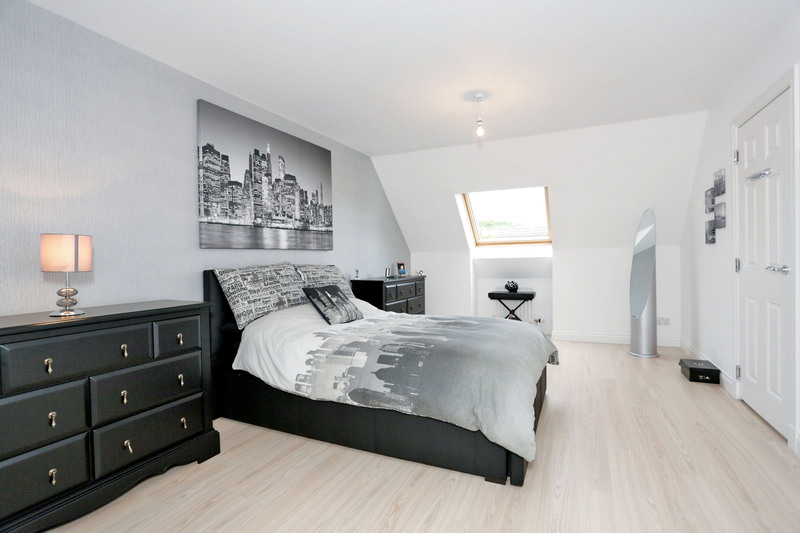 BEDROOM ONE: 3.93m x 4.75m This generously proportioned master bedroom benefits from a papered feature wall, Pergo flooring, four large built-in wooden wardrobes and a large lattice window looking out to the front of the property fitted with a coordinating Roman blind. 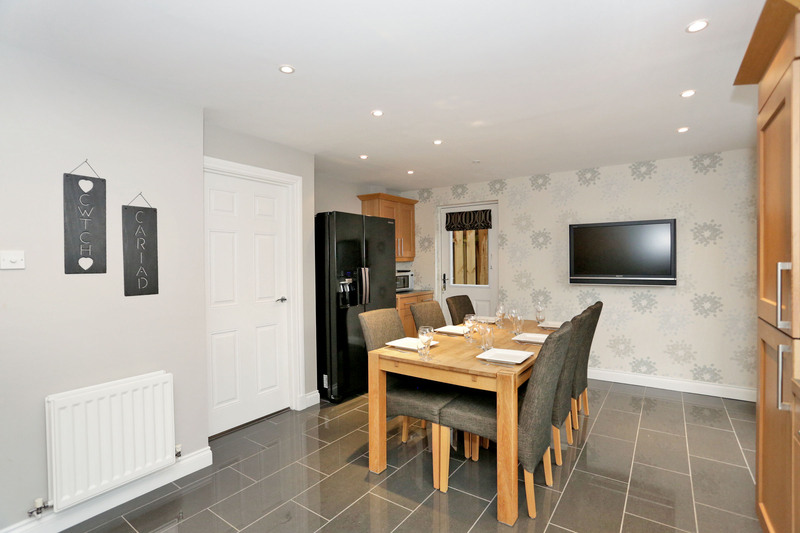 Radiator, television and telephone point EN-SUITE Supplied and fitted by Laings of Inverurie the en-suite shower room has a large double shower, white WC and wash hand basin built into a base storage unit with a large illuminated wall lengthed mirror. Opaque window to the front of the property fitted with a Roman blind. 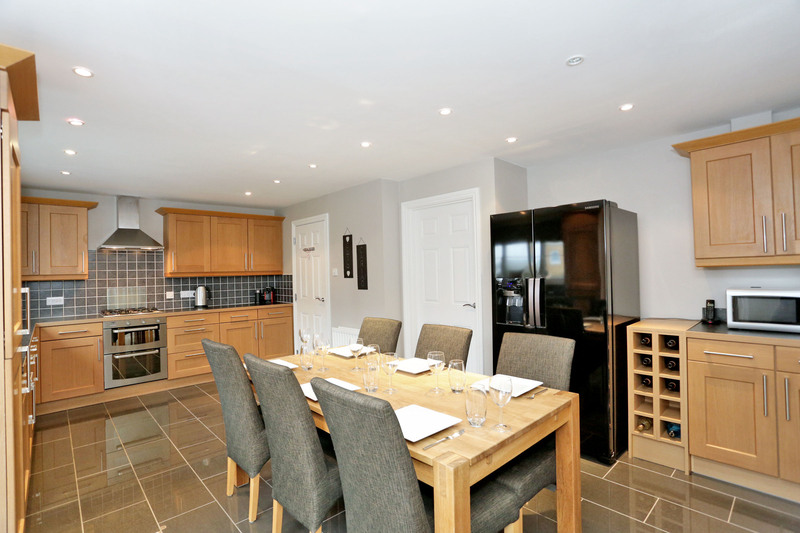 Underfloor heated tiled flooring, chrome towel rail, downlighters and extractor fan. 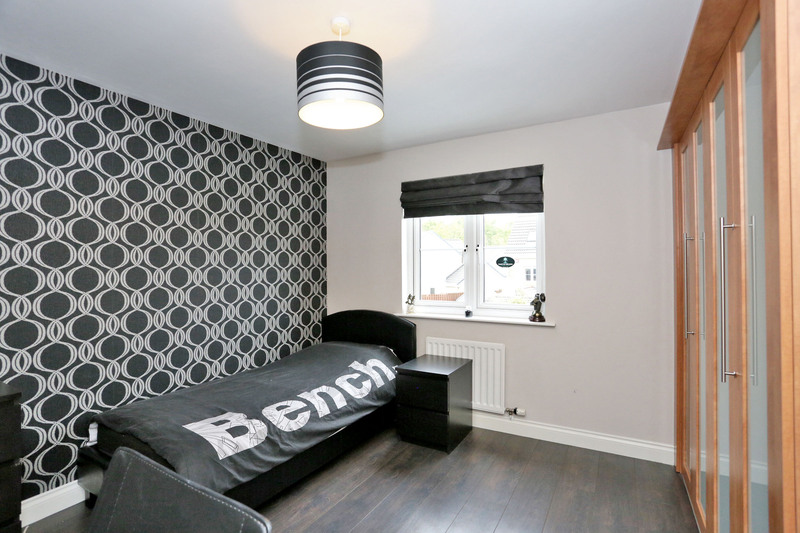 BEDROOM TWO: 3.30m x 3.54m This well proportioned double bedroom with a lattice window fitted with roman blind over looking the rear of the property is decorated in neutral colours with coordinating laminate flooring and double built-in wardrobe. Radiator and Television point. 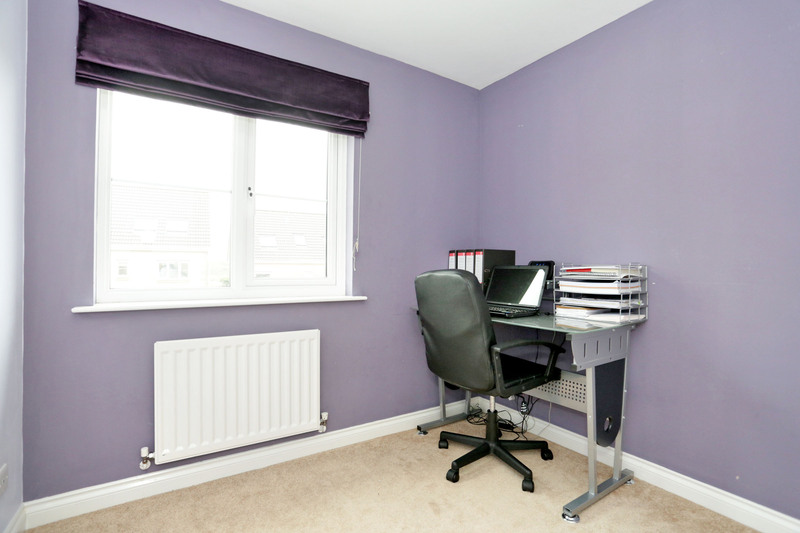 STUDY: 2.41m x 2.25m This study has a fitted carpet, central light fitting and radiator with a lattice effect window looking out to the rear of the property fitted with a roman blind. Television point. 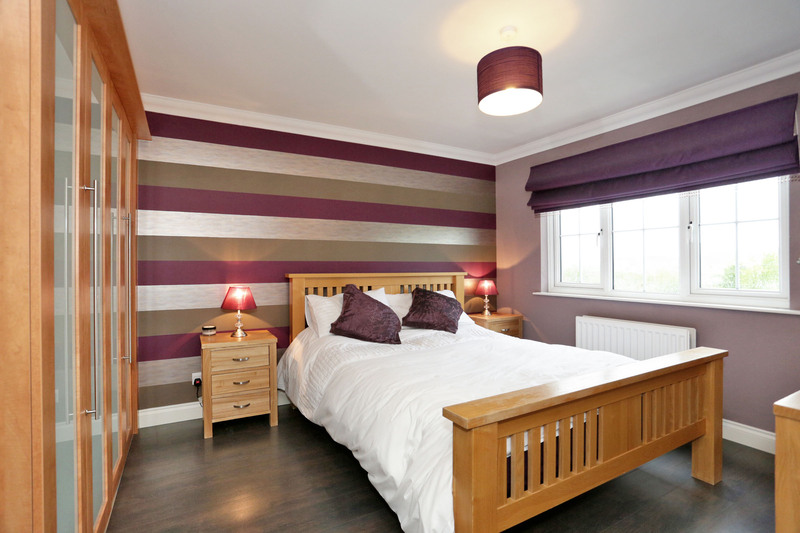 BEDROOM THREE: 3.24m x 3.45m This well proportioned double bedroom with a lattice window fitted with roman blind over looking the rear of the property is decorated with a feature papered wall, coordinating Pergo flooring and double built-in wardrobe. Radiator and television point. 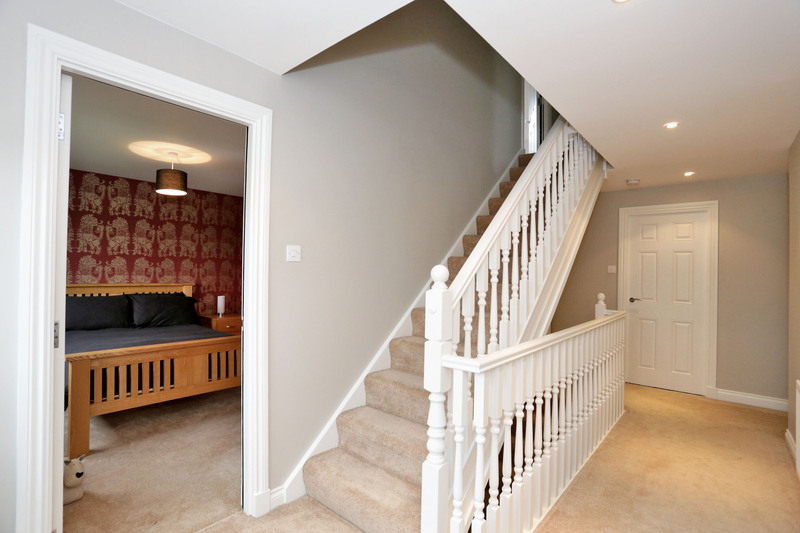 Access to the Jack and Jill en-suite. 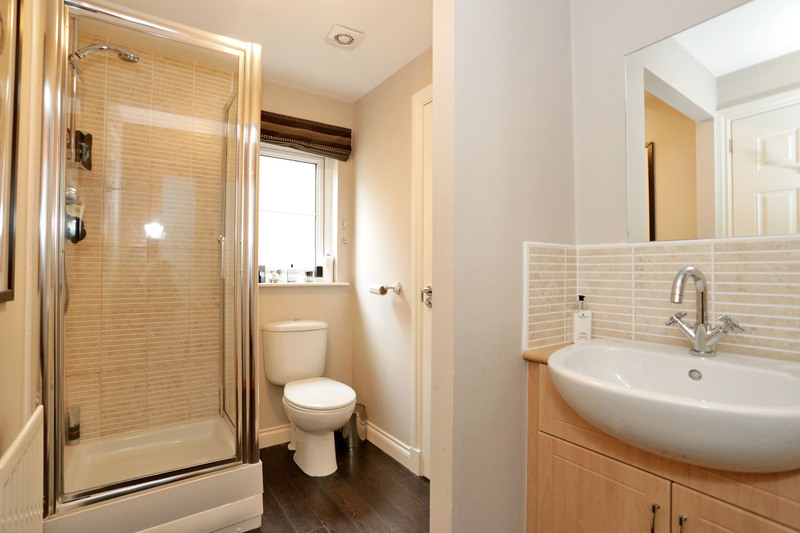 EN-SUITE: The Jack and Jill en-suite shower room comprises a white WC, white wash-hand basin and separate shower cubicle. Opaque window to side fitted with roman blind. Pergo flooring, central ceiling light, Radiator. Extractor fan. 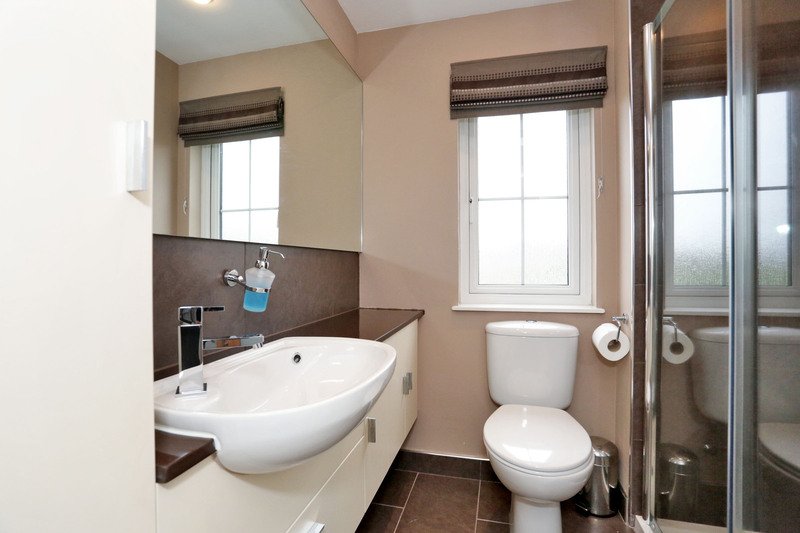 This en-suite is also shared by bedroom Four. 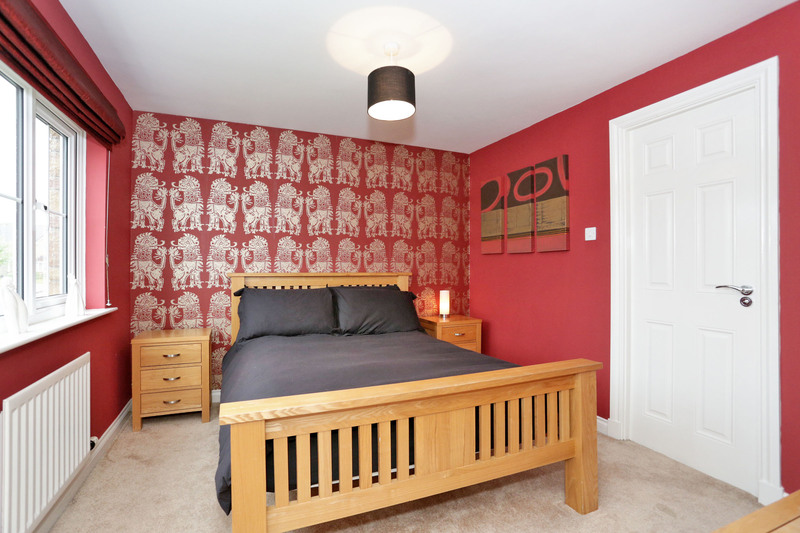 BEDROOM FOUR: 3.01m x 3.42m This well proportioned double bedroom accessed via the first floor hallway benefits from use of the Jack and Jill en-suite shower room. 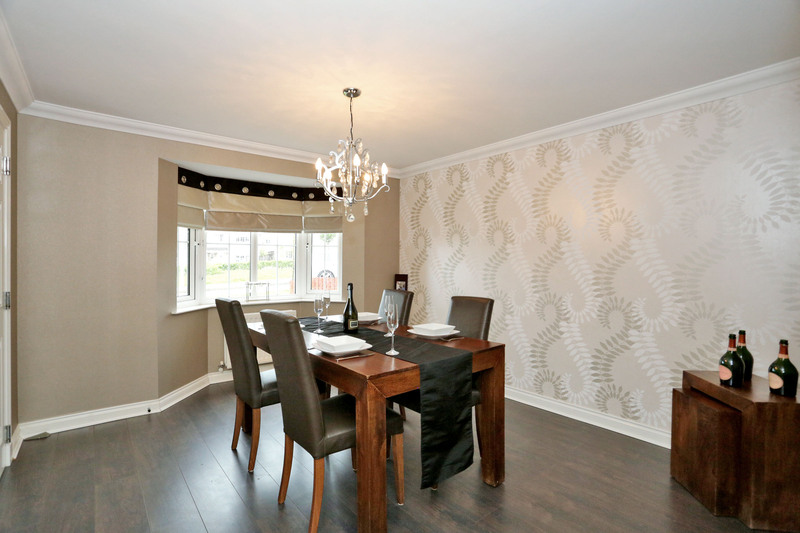 Decorated with a feature papered wall and fitted with a cream carpet this is a lovely bright room. Lattice effect window looks out to the front of the property fitted with roman blind. Radiator and television point. 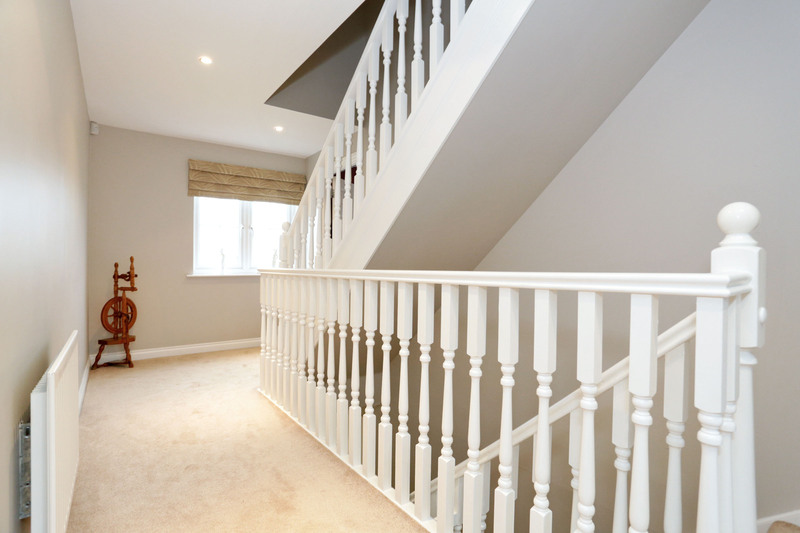 UPPER HALLWAY: The cream carpeted staircase and contemporary white wooden balustrade and bannister lead from the first floor hallway to the upper hallway where the cream carpet is continued and provides access to all upper floor accommodation. Airing cupboard housing the hot water tank with ample shelving. Smoke detector. 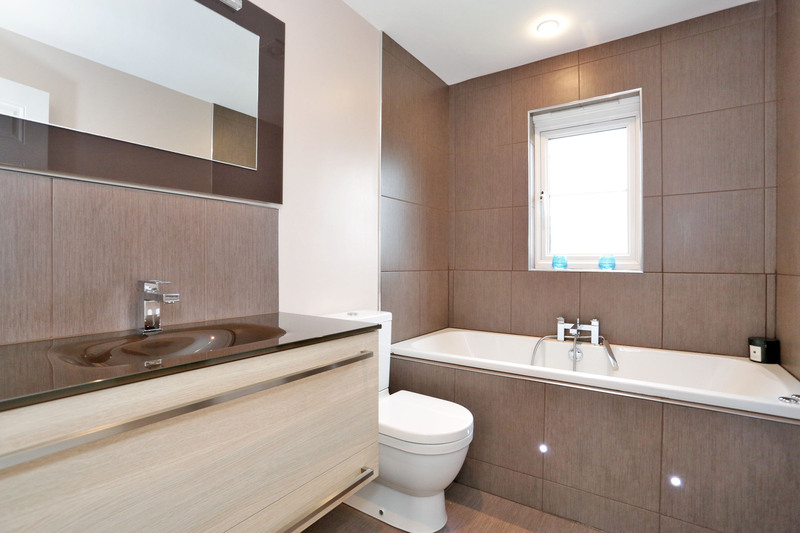 SHOWER ROOM: This contemporary shower room with Amtico flooring features the wash hand basin set within beech effect vanity units and a long display ledge with a wall length mirror above, w.c. and shower cubicle with attractive tiling to ceiling height. Radiator and Extractor fan. 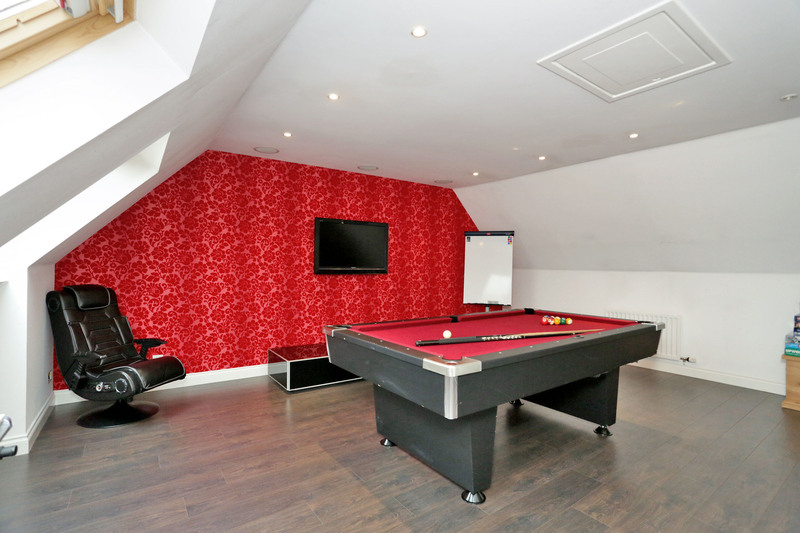 BEDROOM SIX: 5.63m x 5.75m This impressively proportioned bedroom is currently being used as a games room. 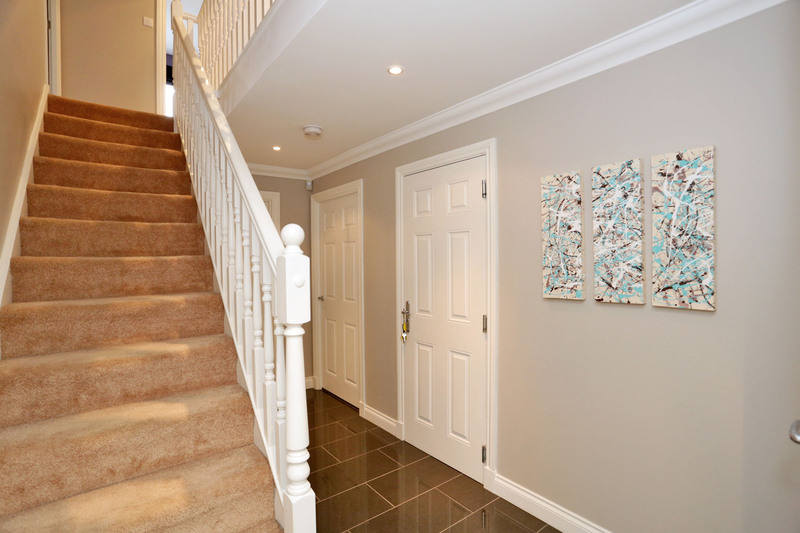 Decorated in neutral tones with feature papered wall with Pergo flooring. Two Velux windows look out to the rear of the property. Hatch to loft accessible by way of Ramsay ladder, the loft is partially floored and has lighting within. Two Radiators, Downlighters, Built-in surround sound and Television point. GARAGE: Large double garage and lighting within and tap. Hotpoint 7kg washing machine in this garage shall be included in the purchase price. OUTSIDE: A small garden to the front of the property is laid to lawn. A tarred double driveway provides up to 4 cars for off street parking and leads to the DOUBLE GARAGE. 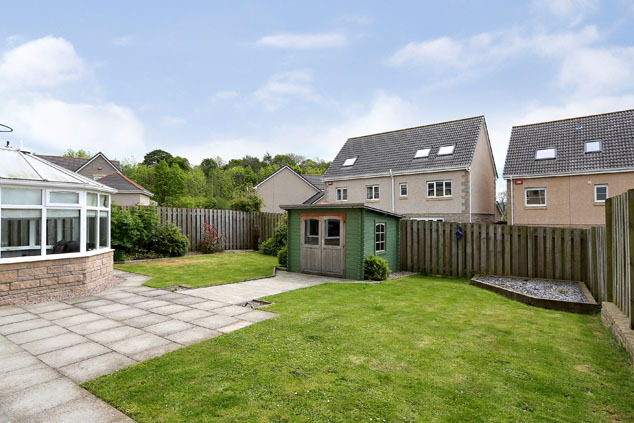 REAR GARDEN: A good sized rear garden enjoys a high degree of privacy and s partially laid to lawn with a patio and pathway to the summer house. Various bushes and shubbery provide an attractive yet low maintenance garden. A small area laid to slate is ideal for outside dining. DIRECTIONS From Inverurie Town Square follow B9170 towards Oldmeldrum and pass the Garden Centre. Continue along this road and take the first road on the left onto Uryside Drive and then take the third road on the right onto Kingfisher Drive. The property is situated on the right-hand side.